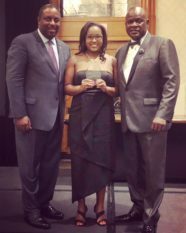 Kenya Jenkins-Wright (’03)with NBA President Juan Thomas (left) and Awards Chair Aubrey “Nick” Pittman. Kenya Jenkins Wright (’03) was selected as a 2018 recipient of the National Bar Association “40 Under 40 Nation’s Best Advocates” Award. The awards recognize the nation’s top 40 lawyers under the age 40 who exemplify a broad range of high achievement in the legal field, including in advocacy, innovation, vision, leadership and overall legal and community involvement. She received her honor at the National Bar Association’s 40 Under 40 Awards Gala on August 1, 2018, during the NBA’s 93rd Annual Convention in New Orleans, LA. Kenya currently serves as General Counsel for the Illinois Guardianship and Advocacy Commission.